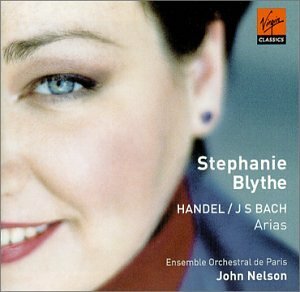 Stephanie Blythe's compact disc Handel/J.S. Bach on Virgin was one of the best recital recordings of 2001 according to Opera News of January 2002. "At Ms. Blythe's side almost constantly, watching devotedly, is her husband, David Smith-Larsen, a former professional wrestler and now an actor. They met when she was singing Mistress Quickly in the Paris Opera's production of 'Falstaff,' in 1999. Mr. Smith-Larsen was the innkeeper, a nonsinging role. Sparks flew." --from an article by Dinitia Smith in the New York Times of October 9, 2003.